Crenelations are an architectural element consisting of a series of raised blocks (merlons) with lower areas (crenels) between them. 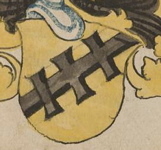 This distinctive and visually striking pattern was adopted into heraldry early on, and blazon (the jargon of heralds) includes several terms that describe the various ways it can be used. A crenelated line dividing a field or charge into parts is blazoned "embattled". Per fess embattled argent and gules. Per chevron embattled gules and Or, three lions counterchanged. Quarterly embattled gules and argent. A single-edged ordinary with crenelations along its edge or a multi-edged ordinary with crenelations along its upper edge is likewise. Argent, a chief embatteld gules. Argent, three chevronels embattled gules. 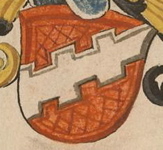 Per pale gules and argent, a fess embattled sable. When a multi-edged ordinary has crenelations on all edges and the crenelations are synchronized so that the merlons on each align with those on the edge opposite, it is emblazoned "embattled counter-embattled". 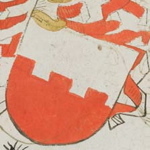 Gules, two bars embattled counter-embattled argent. Gules, a bend sinister embattled counter-embattled argent. Azure, a saltire embattled counter-embattled argent between four birds Or. And when a multi-edged ordinary has crenelations along all edges and those on opposite edges are off-set so that the merlons on one align with the crenels on the other, it is blazoned "bretessed". Argent, two bars bretessed gules. Or, a bend sinister bretessed sable. Gules, a bend sinister bretessed argent. 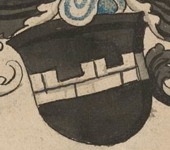 There is one other specialized term associated with crenelations in period heraldry. A fess embattled and masoned is known as "a wall". Sable, a wall argent masoned sable. This page was written and is maintained by Coblaith Muimnech, who holds the copyright to the text and all illustrations not more than 300 years old. It is made available under a Creative Commons Attribution-Noncommercial-Share Alike 3.0 United States License. Click to visit Coblaith's homepage or the index to her heraldry articles. 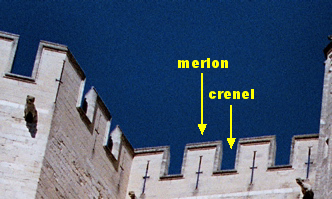 The graphic illustrating the terms "merlon" and "crenel" at the top of this page was developed from a photograph of the Pope's Palace in Avignon that has been released into the public domain. The other illustrations are all excerpted from works created before the year 1600.